Explanation: Why are many large craters on Mercury relatively smooth inside? 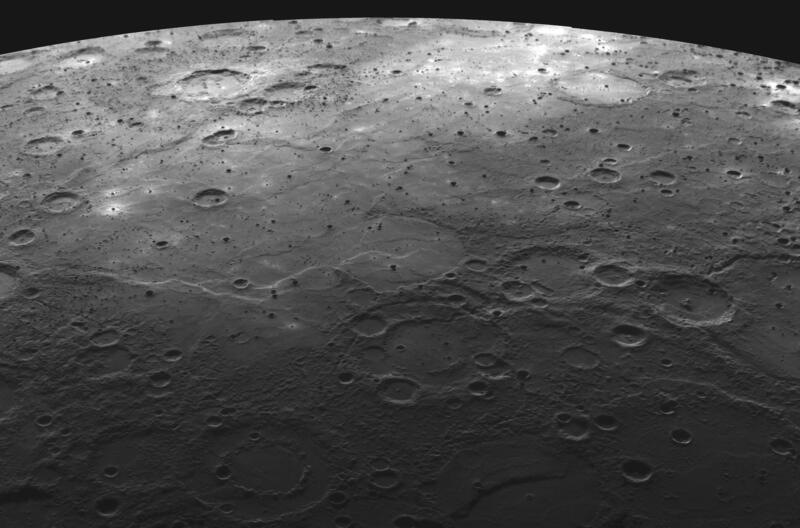 Recent images from the robotic MESSENGER spacecraft that flew by Mercury last October show previously uncharted regions of Mercury that have large craters with an internal smoothness similar to the maria on Earth's own Moon. Therefore, like our Moon's maria, these craters on Mercury are thought to have been flooded by lava floes that are old but not as old as the surrounding more highly cratered surface. The above image mosaic of the western limb of Mercury was created by MESSENGER as it approached the Solar System's innermost planet last October. Old and heavily textured terrain runs across much of the image bottom, while across the middle left lies comparatively smooth impact basins where small craters may appear similar at first to protruding hills. MESSENGER will buzz past Mercury again next year before entering orbit in 2011.